Video presentation and stills of new VW Golf MkVII leaked online ahead of Paris preview. As the countdown to the unveiling of the Golf MkVII begins, Volkswagen has given a media presentation showcasing some of the car&apos;s most prominent features. Meanwhile, German publication Auto Zeitung released leaked images of the seventh-gen Golf ahead of its release anticipated for tomorrow, September 4. The car will be the first vehicle released on VW Group&apos;s new Modular Transverse Matrix platform, which is also set to underpin the Audi A3 and Seat Leon among numerous others over the coming years. The new Golf was last seen undergoing cold-weather testing in the snow, but this latest video gives us a good preview of the car&apos;s shape and as well as revealing some of the new technologies that will distinguish it from previous generations of the fast-selling benchmark hatchback.. These include fatigue detection, lane assist, an auto brake feature, adaptive cruise control, and cylinder deactivation. However it remains to be seen which will make their way onto the US-spec Golf. 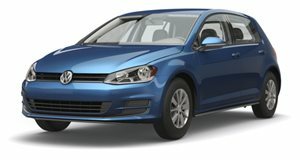 Expect the Golf to go on sale in the States next year as a 2014 model, boasting improvements as a 100kg reduced curb weight, despite a larger frame and a roomier cabin.